Cuckoo for Coconuts: WHITE HOT! 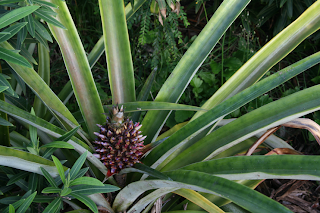 Yesterday we plucked our first pineapple of the season from our pineapple patch. Lat year around this same time we got two. We do have another one that looks like it might be ready at the end of summer. The difference this year is that this one was a WHITE PINEAPPLE. It was not all that big, about 6" tall and 4" across and although it was nice and golden on the outside I did not have high hopes for what the inside would hold. When I cut into it and saw that it was pure white my hopes of a tasty afternoon snack vanished. I was sure it was going to be either flavorless or very sour, but to my surprise it was spectacularly sweet. A quick google search provided me with a few answers as to what variety it might be. It could be either what is called a KONA SUGARLOAF or a PERNAMBUCO... and I am guessing it's the Kona Sugarloaf. I will have to do some further investigating. 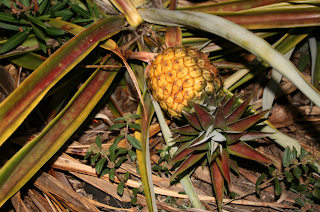 This is one pineapple top that will be placed in the pineapple patch and properly marked as white. White Pineapple and Mango salad. That's it pineapple and mango... what else do you need? I cut it up and mixed it with a deliciously sweet mango from one of our trees. 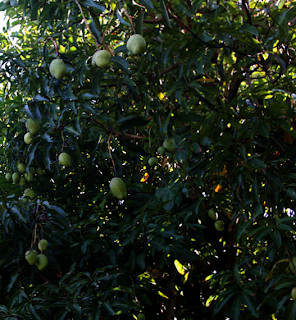 The mangos are very abundant this year, unlike last year, but they suffer from a few natural problems. 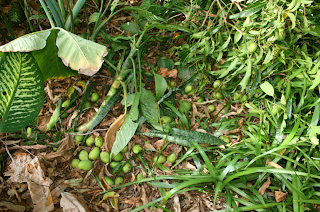 We have 2 trees that have lost very large branches filled with unripe mangos. We have had a bit of a drought and then a few hard rains. I feel that the trees soaked up the rains so fast that the branches became to heavy and broke off. I managed to save a great deal of them by placing them in brown bags to ripen and managed to get a few jars of jam out of those. 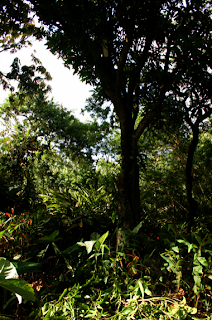 Even though the trees are quite heavy with fruit, most are either eaten on the tree by birds, bats or cute country rats. We have to keep our eye on them everyday and be quicker than those critters, but they have to eat to... there's plenty to share. You can just make out the white flesh of the tree near the top on this "common" mango. Common or not, it is still delicious. The victims of the tragedy. A few hold outs I am keeping my eye on. 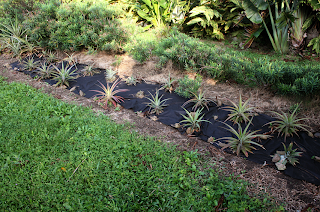 I would have never guessed that pineapples take so long to grow. Yours look gorgeous. 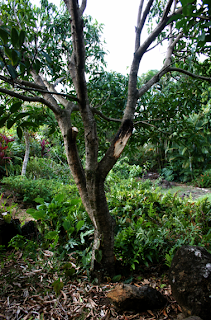 Last year I visited the Dole farm on Oahu on the way up to the north shore. They all looked alarmingly uniform....definitely NOT organic! 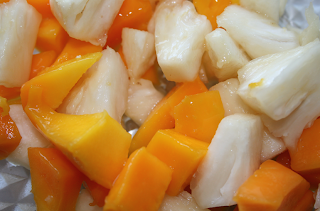 Home-grown exotica white pineapple + home-grown ever so sweet mango = a taste of heaven on earth. (As well as doing such an excellent job cultivating these garden yummies). It was small but it sure was tasty. If you ever see one... pick it up. OMG, the pineapple and mango salad looks delicious! YUM-O!